Soooo Much Fun, But Be Careful! Friday’s deluge left satisfying slicks on the balcony that runs the length of Tucker and Lisa’s house. 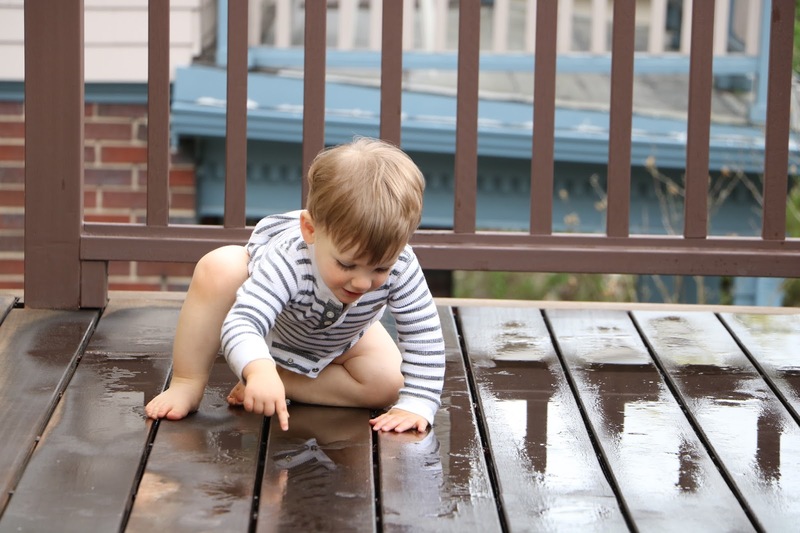 Once the rain stopped, and the charms of building block towers, scaling stairs, and reading books have been exhausted, Dave and I release our small grandson to jump and march in the balcony’s puddles. Careful! The word and warning circle in my head, and I strive to stifle it as Paul gleefully scampers the length of the balcony and dances in the pools. Fun! The squishing, the flailing, the drumming, and splashing. The thrilling surprise of a little slip and a slide! Careful! Oh, it’s hard to contain it, and I sense Dave’s eyes rolling at my worries. And then, oops! Paul goes down, his feet whipping out from under him. He lies in the puddle, eyebrows furrowed, and whimpers. A brave, little question of a whimper. “You’re fine! “ we assure him with exaggerated heartiness as we set him on his feet… and off he goes! 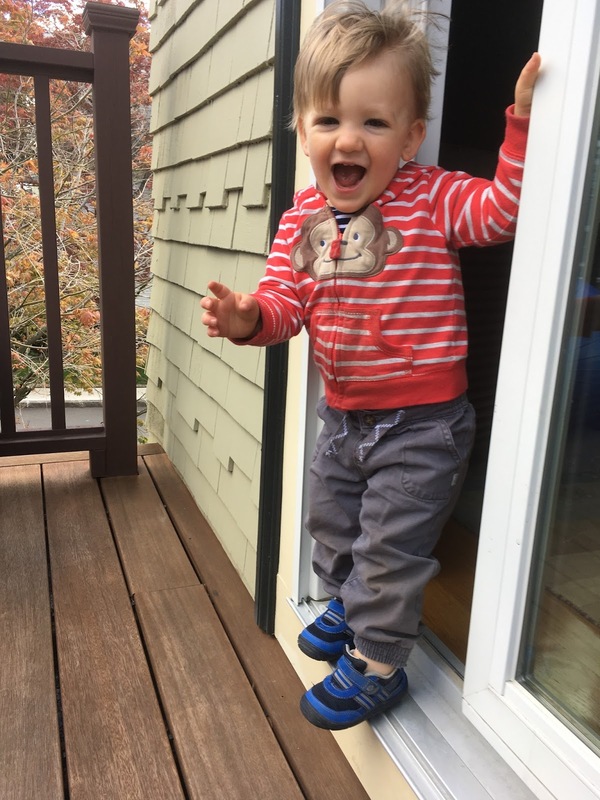 It would take far more to squelch this little guy’s high spirits. 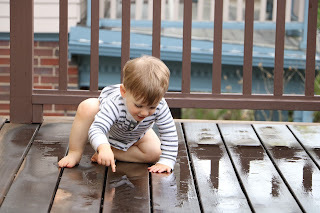 Eventually he tires of the wetness and running, or maybe we are the ones who tire first? Anyway, we head inside, but the good times are not over. Dave readies a bath with just-right-warm water and spells out “Paul Sylvestro” in yellow-red-green letters, vibrant against the white porcelain of the tub. A waterproof book, rubber ducky, and small Rubbermaid bowl float in readiness. Who wouldn’t want to dive in? Getting clean is barely a consideration as Dave and I whoop, holler, and applaud as water flies. 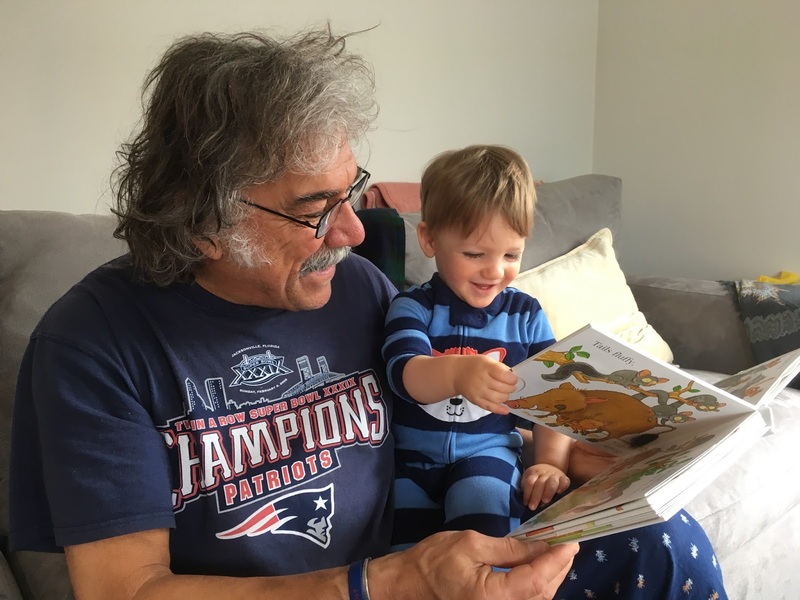 In a high-pitched trill, with more than a hint of Julia Childs, Dave initiates a tale, “It was a lovely day in a calm little pond, and the fish were enjoying a quiet swim, when suddenly there was… A TSUNAMI!” What splashing and waves and giggles ensue! It requires one demo only for Paul to embrace the game, and he waits expectantly, a small smile playing at the corner of his lips, as Dave prattles about the pond…and then… TSUNAMI! And oh, the fascination of a sinuous, crystalline thread poured from the Rubbermaid bowl. Paul’s eyes sparkle as he lifts both arms, angling his hands this way and that, opening and closing his fingers around that elusive, shimmering thread. And when I pour A WATERFALLLLLLL (for Dave and I intone this with as much volume as the TSUNAMI!) over his head, Paul sobers a moment, blinking his eyes clear. 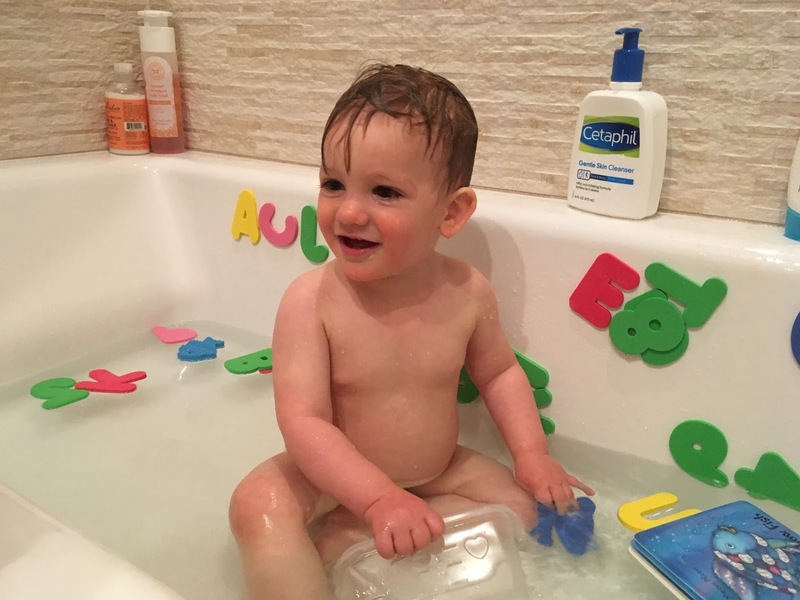 He wonders if this is unpleasant or delightful, then warms to the idea, dousing himself repeatedly, unconcerned, by then, about water in his eyes and nose. “Look at that,” says Dave as Paul lifts the bowl, having assumed the role of overhead-waterfall-god himself. 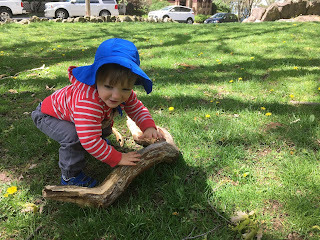 “He’s figured out how to aim the stream even though he can’t see it.” For as much as Paul is fascinated by every piece of lint on the rug, every twig in the grass, every sound we squawk, so are we fascinated by this boy and his quick grasp of things new. 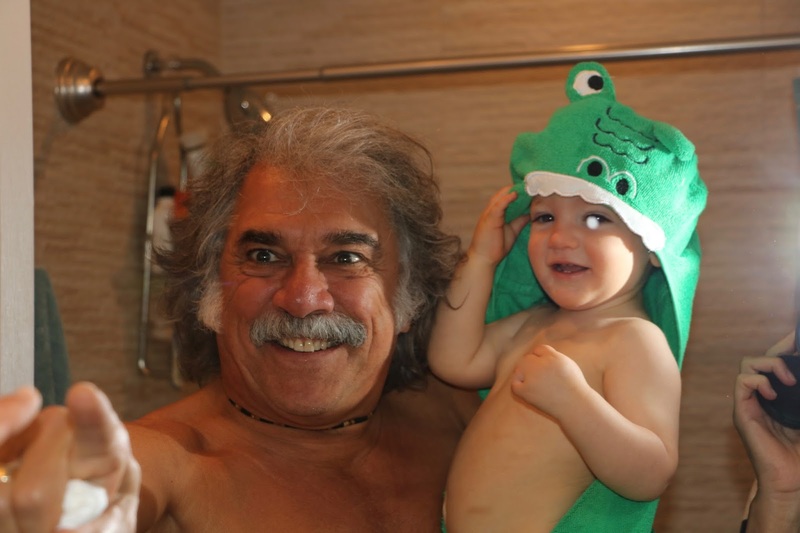 When the water grows tepid, we lift this perfect, precious, slippery, little soul from the tub and wrap him in a cozy, froggy, green towel. Who’s that cute boy? We ask, as we peer into the mirror. You’re all green! Are you a frog? What a joyous respite from adult cares this is for us, to dwell with Paul in a world of primary colors, Pat the Bunny, TSUNAMIs, tiny sneakers, and frog towels! Once he’s dressed and had his snack of Cheerios, blueberries, cheese, and yogurt treats, Paul squats on his haunches and flips the silver catch on Dave’s guitar case. Flips, flips, and flips. Flips, flips, and flips. Such focus! Such study! What is he thinking? What is he learning as that chubby, index finger persists in flipping; as he hears the click of metal against metal; as he sees the light shift and change as the catch moves? And if home and tub contain wonders aplenty, a walk to the park holds a surfeit of splendors. Paul discovers acorn caps pressed into the soil, filthy but intriguing, definitely worth digging up. And look! Oh Paul, look! A squirrel! Do you see him? See his bushy tail? Or, do you hear that sound? It’s a bird. Can you say bird? And passing by on the road: a bus! Look! A bus! And I break into song, The wheels on the bus go round and round… Every passing vehicle, every creeping creature, every flowering plant seems a fortuitous offering, an opportunity for learning and joy. What a gift to re-open to the world’s small miracles oneself, when walking about with a little one. “Look, Paul!” says Dave, slowing his gait to one weak and wobbly, and holding a curved stick in his hand. He totters along muttering in a creaky voice, “I’m just an old man leaning on my cane.” Paul is mildly amused, and he likes the look of that stick. While still too young to see a gun there, thank god, he senses its value and picks one up. How natural, so boyish, but of course, I worry. What if he stumbles and pokes out an eye? I want to deliver this child intact to his parents, and my habitual risk-avoidance antennae are on full alert. For this weekend is an experiment. For the first time since Paul’s birth, Tucker and Lisa have stolen away to relax and refresh, leaving their boy in our care. And I feel the full blessing and responsibility of that trust. So, on our way back to the house, like a guardian crone, I hunch over my grandson, holding his hood so he won’t face-plant on the sidewalk. I’m sure Dave’s shaking his head at my hyper-vigilance as he strolls beside us, pointing out leaves, car tires, violets, and tulips. Once back inside, Paul races to the sliding doors that open onto the balcony: he’s ready for more puddle fun. But, the sun has been out and doing its work, drying. 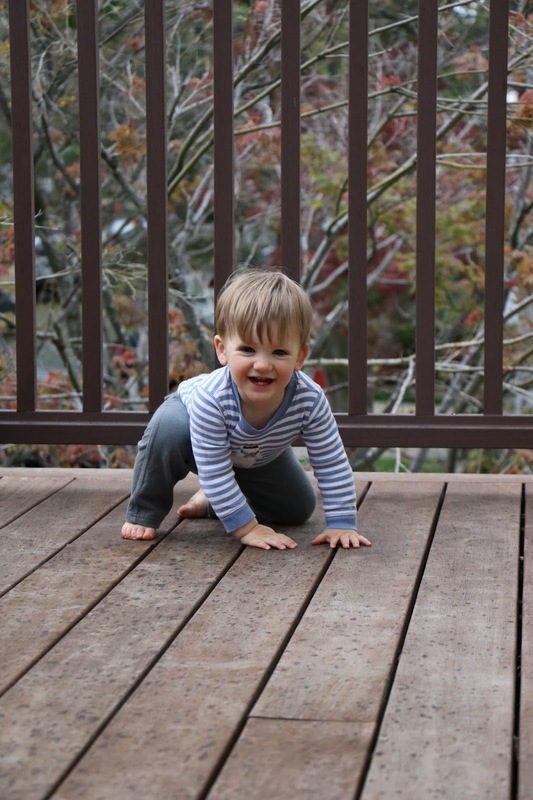 The boy’s face is a study as he trots to the balcony’s end, turns in a bemused circle, tries out a little dance, and bends down for a closer look. Where did the water go? Without the rain carpet, I tune into the possibility of splinters, so no more barefoot frolics. Sigh. Another carefree joy stolen by an adult. Dave says nothing, but I imagine he’s biting his tongue as I take Paul in my lap and tug on his socks and blue sneakers. So stoic my Dave in holding back comment. So stoic, his Lea, in limiting, as best I can, my knee-jerk cautions about playing ball in the house, about the size of bites of food cut for Paul, about running on sidewalks and balconies. And between the three of us, the experiment’s a success! Tucker and Lisa return beaming from their time away together, and we hand into their waiting arms their son, happy and whole. Well, almost. A half-hour before their arrival – despite constant attention and old crone hunching – Paul swiped at the balcony floor and got a stitching of splinters!